The excitement of the first round has somewhat subsided over the break but Honiara and the rest of the country, via the national broadcaster Solomon Islands Broadcasting Corporation, will come alive again with football once the ball starts rolling. The fight to finish in the top tier will even be more intensive this round as the clubs look to cash in on the hefty prize packages that are in store for the top performers with the winner standing to take home $150 000-00. The match to open TSL round 2 is the clash between fifth ranked KOSSA and Real Kakamora which will kick off at 2:00pm on Saturday at Lawson Tama and at 4:00pm the main match of the day will take place with Marist Fire taking on leaders Koloale. KOSSA finished off Real Kakamora 3 to nothing in the first round but the Makira Ulawa side has been shopping for players during the break and will surely be a better side, however, the odds still remain in favour of the KOSSA who are looking to apply pressure on the top 3 sides. The Marist Fire v. Koloale meeting in the first round went 2 – 1 Koloale’s way quite controversially in a match that was played under wet conditions so Marist Fire will be out to settle the score against the leaders with the weather looking more favourable this time round. 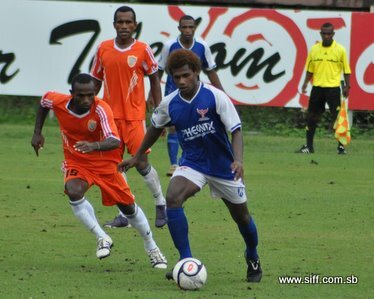 Sunday continues with more national league football as Solomon Warriors and Malaita Kingz open the day’s show at 2:00pm and then at 4:00pm Western United take on Hana for another interesting tussle between the roughly evenly matched sides. Solomon Warriors will be further strengthened by addition of new players to their line up including Frazer Maebule who featured for Fiji club Rewa in the local Champions League earlier this year but their opponents Malaita Kingz are also lining up new players for the second round especially to power up their striking force and they will not be as easy to deal with for Solomon Warriors as in round 1. Hana will be looking to improve against Western United who were narrow winners in their first meeting and the story for this match will definitely not be the same with more improvement seen in their recent matches. The second round of the TSL is expected to be completed by May 15.